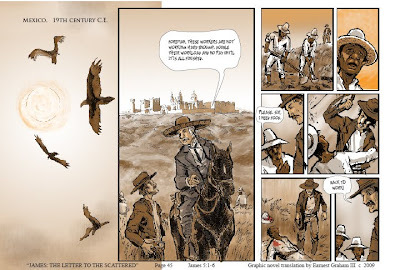 This scene depicts the words of James in 5:1-6 in the setting of 19th century Mexico. The greed and corruption of many landowners, and their oppression of workers seemed like a fitting picture for this passage in James. The challenge of translating the Bible in any form is this: how do you take a message delivered thousands of years ago and give it voice to speak to the world today?When the prophets and writers of the Bible delivered God's word, they did it to people in a specific time and place. The hearers of the word knew the geography, the references and situations being described. The word was given to a specific people in a specific time and place. And yet, we hold by faith that God's word is eternal. We have witnessed it's power in the present, and know it to be applicable to our lives today. 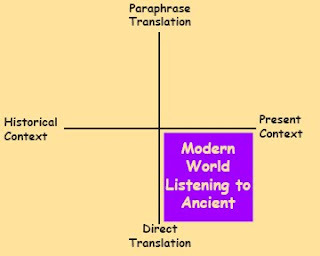 One of the primary responsibilities of a translator is to make decisions: Do you focus on the ancient world or on our modern lives? 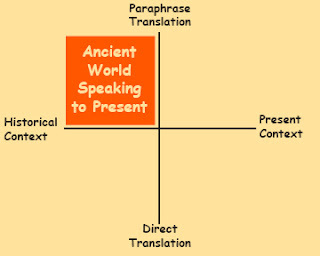 How closely do you follow the form of the original languages, and when do you need to use modern phrases and ideas to convey the message? Bible translations take into account who will be reading or hearing the passage(s). What is their age? Where do they live? Would they understand the references? This way focuses on the written word and the world in which it was originally proclaimed. It's strength is to provide background which may be missing in our world today. Crumb does a verse by verse illustration of the entire book of Genesis, working primarily from a translation by Robert Alter. His work shows a great deal of research on the ancient world, and his approach is primarily a narrative translation. This way of translation retains a focus on the biblical world, but uses words , phrases and images more familiar to a modern reader. These books seek to cover large portions of scripture in a volume. The translations lean towards paraphrase. Modern phrases and dialogue are added to engage young readers, and they are especially helpful for becoming acquainted with the biblical stories. can be applied in our life and times. 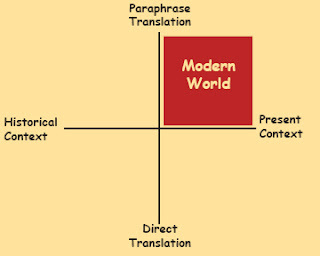 This approach focuses on the modern reader. These stories blend the ancient world and modern world. They are especially useful in looking at the big picture of the bible, and highlighting important themes in the stories. Even with these examples, we have only begun to scratch the surface of what Comic translations can do to share the message of God's word. Project Idea: Choose a passage from the Bible, and write four different scripts using these four approaches. How does it change the way you tell the story? What kind of preparation is needed to write it? Show the translations to a variety of people. How do they respond? Do you find that one approach works better than another? Labels: "how to create a bible comic"
The following script is based on the translation in Part I. It is written in two formats. Pages 1 and 2 are written in a plot format which describes the story in paragraph form. Pages 3 and 4 are written in a panel by panel description of the story. What are the advantages and disadvantages of each format? Which would you use? Background: This is a transition scene in Luke’s gospel. It comes between the birth of Jesus and the coming of John the Baptist who prepares the way for the coming of Christ. In this passage, Jesus is 12 years old, on the cusp of becoming an adult in the eyes of his Jewish community, but still a boy. The scene is 1st century Jerusalem during the Passover Festival. Jesus’ parents traveled every year to Jerusalem for the Passover, but the text sounds like this may be Jesus first trip to Jerusalem for the feast. You can imagine what it is like to travel from the small, very rural village Nazareth up North, to Jerusalem- a big city, packed with people from all around the Mediterranean who are there for the Feast. I imagine that he is filled with awe and wonder as he takes it all in, and as he steps out into this broader world, gets lost in the experience. It is an important transition, in a couple of ways. It shows Jesus growing into maturity, and becoming aware of his identity and his purpose. It also foreshadows an important theme that emerges in his story- the experience of being lost and found. In Luke Chapter 15, Jesus tells three stories of lost and found (the lost sheep, the lost coin, and the lost son.) And later, he identifies his mission saying “The son of man came to seek out and save the lost.” (Luke 19:10. )For this reason, I choose to emphasize the experience of losing something important, and searching everywhere until it is found. The scene opens with the view of pilgrims travelling into Jerusalem. They travel in groups complete with animals for carrying supplies as well as animals to offer for the sacrifice. The city is crowded with people, and the Temple is in the background. The story focuses on Jesus, young, but showing signs of growth. To give the scene a little context, let’s show Jesus walking around and experiencing the Feast in Jerusalem. You may want to show him eating a Passover meal, or showing affection for one of the lambs which will be offered up at the temple. This can be a couple of scenes in sequence, a montage or a vignette. The impression of this scene is of awe and wonder, and we should feel like we are with him in the discovery. Jesus parents are in the background, but seem content to let him explore in the company of his friends. Show Mary and Joseph leaving Jerusalem in a caravan. Perhaps show other children Jesus’ age in the crowd. Show Jesus wandering in Jerusalem, heading toward the Temple, almost as if he is drawn to it. Meanwhile, on the road again, Mary and Joseph have travelled a day’s journey north from Jerusalem, when they realize that Jesus is not with them. They look in the expected places, among family and neighbors who travelled with them on the journey, but do not find him. Here we focus on the emotions of the parents. At first they may be wondering where Jesus is, but because they think they know the answer, they are not as concerned. When they search and do not find him, there is the moment of dreaded realization that he is lost. We are told later that it causes them pain. (No doubt!) Joseph and Mary leave the group, and begin the trip back to Jerusalem. The journey back to Jerusalem, on the road. The sun is setting, and they still have time to go before they get to Jerusalem. The next morning, arriving in Jerusalem, they begin the search for Jesus. The Temple is in the background. Meanwhile, Jesus is in the Temple, sitting in the middle of a group of teachers. He is listening to what they are saying and engaged in the conversation. A closer view as Jesus responds with a question that shows genuine wisdom and insight, and amazes the teachers. Panel 5: A view of Jesus in the foreground, with the teachers focused on him. In the background we see Jesus’ parents as they stand in the door, probably catching their breath. Panel 6: Close up view of the parents, expressions of amazement, relief, and yet somewhat stunned by the whole experience. Jesus goes with his parents, leaving the teachers behind. Jesus returns with his parents to Nazareth. Narrator: And he went down with them and returned to Nazareth. And he was obedient to them. A shift in perspective- we see Jesus through his mother’s eye’s, watching him grow. Mary looks reflectively at him as Jesus goes back to life at home. He could be working in the carpenter shop with Joseph, or fishing, or working in a wheat field, or studying. It’s an appropriate place to think about the kind of daily experiences that work their way into Jesus’ later teaching and ministry. This is the first in a series on "How to Draw Bible Comics." 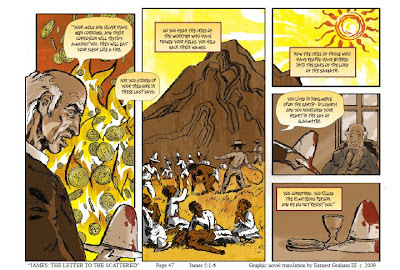 The series will feature basic steps in creating a comic, and special considerations when translating the Bible into this visual language. Over the next three months, I will post the development of a comic translation of a passage and offer ideas and resources for making your own stories. Feel free to join in. Each lesson will have a project for practice. Find a friend and share your work with them. You are also welcome to comment on the posts if you have ideas, questions or topics for discussion. I have chosen the story from the Gospel of Luke, Chapter 2:41-52. The story is a rare glimpse of Jesus as a boy, when his family goes to the temple. The passage has all of the elements of a good story, - a beginning, middle, and an end, tension, drama, human emotion, conflict and resolution. And it is set against a backdrop that is fun to enter as an artist and story teller. Once the passage is chosen, the next step is to consider how it is translated. The Bible was written in ancient forms of Hebrew and Greek, and words do not always translate on a one to one basis. they can have a variety of meanings based on the context in which they are spoken. One way to get a sense of the variety of meanings in a passage is to look at the same verse in several different bible translations. 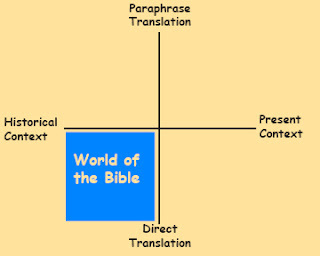 Websites like The Bible Gateway has numerous tranaslations and tools for word study if you want to go deeper. I also find Great Treasures to be helpful if you are familiar with basic greek and want to learn more. This passage in Luke is pretty straight forward. Here is my working translation of the passage, based on the greek text. Every year, Jesus’ parents would travel to Jerusalem for the feast of the Passover. And when he became twelve years [old] they went up, as was the custom of the feast. Now when they had fulfilled the days, they returned, but the boy Jesus remained in Jerusalem, although his parents did not know it. They thought he was in the company of travelers and went a day’s journey. They looked for him among their relatives and acquaintances; and when they did not find him, they returned to Jerusalem to look for him. After three days they found him in the temple, sitting in the middle of the teachers, listening to them and asking them questions. All of the ones who heard him were astonished at his insight and answers. When his parents saw him, they were amazed. And he said to them, “ Why were you looking for me? Didn’t you know that I must be in my Father’s things?” But they did not understand the word he said to them. And he went down with them and returned to Nazareth, and he was obedient to them. His mother kept all of these matters carefully in her heart. And Jesus grew in wisdom and age and grace before God and human beings. Comics are a primarily visual language. You can tell a story in comics by combining words and pictures, or simply a use a sequence of pictures. 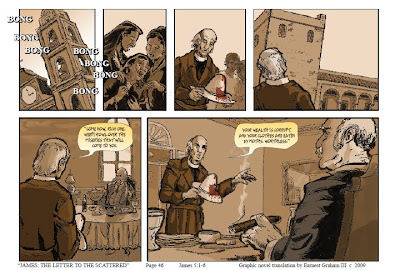 When making a bible comic, it is helpful to ask at this stage, how much of the text will I use? Is it possible to use all of it, and let the pictures illustrate the words. Another possiblity is to ask, what can be shown in pictures alone? What would be helped by having narrative in it? and what portions (like dialogue) simply need to be written? I have color coded the translation above to help sort out these decisions. The words in black represent the portions which may best be described in both words and pictures. The words in blue are portions which I would like to convey solely in the artwork, and the words in red are dialog and phrases that I want have written. Now that we are becoming familiar with the bible passage, it is good to step back and ask some questions. Who are the characters in the story? Where else do they appear in the bible? What do they do? What comes before this passage? What comes after? Where do the scenes take place? This story takes place in (1) Jerusalem and (2) on the road, a days' journey from Jerusalem. What would the landscape and architecture look like? The story tells us that it is during the Passover Feast, and that people were expected to go to Jerusalem for the feast. You may ask, what is the passover feast? How would you show it in a story? How much do you want to show. This passage indicates that there are many people in the city, and that Jesus family is traveling with a group of people from their region. What would clothes would they wear? What kind of animals would they have traveling with them? It is also helpful to think about the action in the story. I wonder in this story, how did Mary and Joseph feel when they realized Jesus was missing, and when they could not find him immediately? This is a great place to draw from your own experience of what it is like to lose something. Where did you look? What was it like when you found it? What does the story look like when we see it through the eyes of the boy Jesus, who is engaged in a rivetting dialoge with teachers. What does it feel like to be a child in the eyes of the world, and yet growing into maturity? Asking questions and searching for clues can really help to flesh out the story, and to make it real for you, and relevant for the readers. 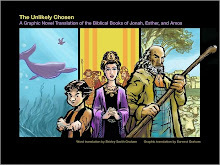 Using a bible translation of your choice, or a variety of translations, write a description of the story. In the margins, write any questions you have in mind. Try to imagine the scene as if it were in a movie. 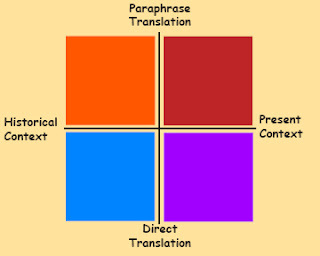 Using your translation, imagination and research, write a one page description of the story.